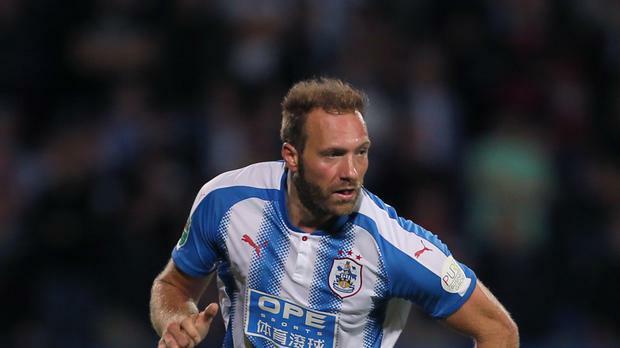 Huddersfield's big Belgian striker Laurent Depoitre feels he is ready-made to keep living the Premier League dream. Summer signing Depoitre, 6ft 2in and weighing over 14 stone, announced his arrival with a classic centre-forward's goal on his league debut in the recent home draw against Leicester. He is likely to lead the line again at the John Smith's Stadium on Saturday lunch-time against Tottenham when he could cross swords with fellow countrymen Toby Alderweireld and Jan Vertonghen. "The style of the Premier League, it's for me," Depoitre told a press conference. "A lot of duels, intensity and action from one side to another. It's the type of football that I like. "It was a dream to first play in the Premier League and then score in the Premier League in my first game, so now I try to keep going and improve in every game." Depoitre displayed all his best attributes when notching his first goal in England against Leicester, out-muscling centre-half Harry Maguire before arrowing a low angled shot inside the far post. "It's one of my best qualities - for a striker it's important to be strong and be good in the duels, win in the air and to keep the ball in front to help the team," he said. "When you can score on your first time in the starting XI it gives you confidence and you feel better on the pitch." Huddersfield have defied the critics by taking nine points from their first six Premier League matches, but Depoitre accepts Tottenham represent their toughest test yet. "It's the first big club we're going to play against and I look forward to playing against a club like this," he said. "But it's going to be tough. For me there is Alderweireld and Vertonghen, who I played with in the national team, so I know them and I think they are one of the best (defensive) pairs in the Premier League. "When you come to England you know you're going to play against big clubs like this and as a player it's what you want. "You want to play big games against teams like that and very big players. Every player wants to play against the best." Depoitre, signed from Porto in June for £3.5million, puts Tottenham's Harry Kane in that bracket, with the England striker notching his 11th goal in seven appearances for club and country this week. "I think he's one of the best," Depoitre added. "At the moment he's one of the best because he's scored a lot this month. It will be a hard job for our defenders. "Harry Kane is a very good player, so we're going to have to pay attention to him."